I was lucky enough to be nominated for a Sunshine Award by the lovely Bek at Crave! Well, lets be completely honest here, I don't have a favourite philosopher as such (as most of the time, philosophers are slightly out of touch with reality) though I do have a few people in my life who totally trump any philosopher. Why? Because these people share their wisdom right when you need it the most. Hm, that's a tricky one - I'd say 8. 3. What is your favourite animal? Puppies! You can't beat a puppy! The picture above on the left was from the first day we got my beautiful baby girl, Chanel! 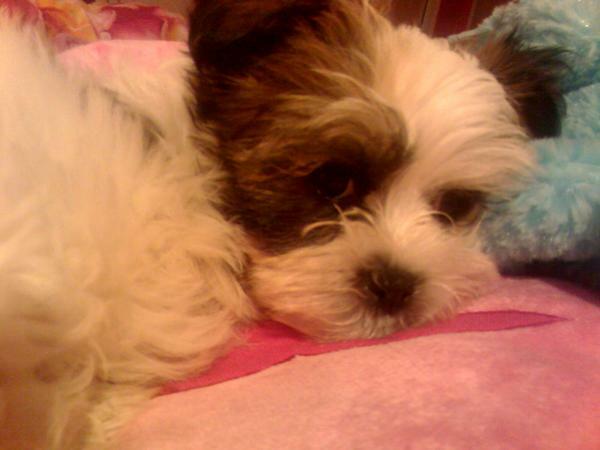 Her puppy, Pudding, was bigger than her and she fit in my palm, with her head between my middle and pointer fingers. Now - she's grown so much you wouldn't even know that was her! 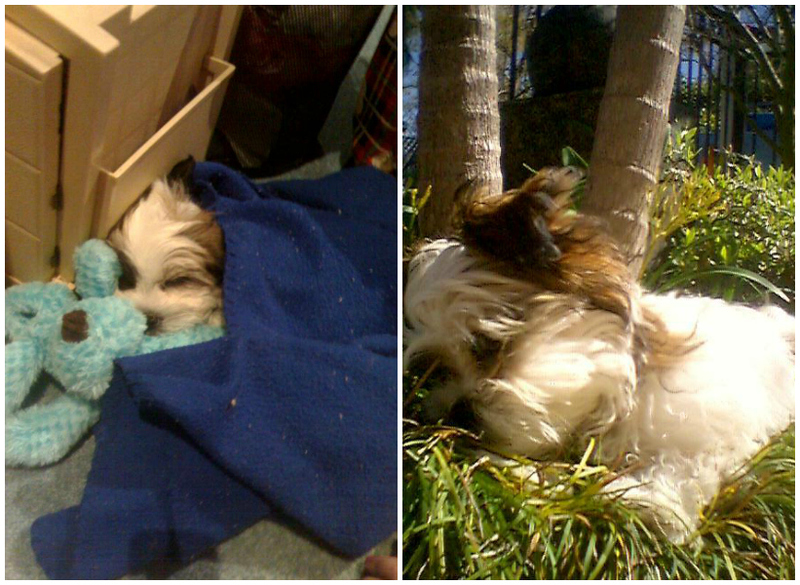 The picture on the right was her favourite sun baking spot as a puppy - a pot plant. We came home one day to find that she had jumped from the ledge surrounding the grass, right into the mondo grass in the pot plant - soaking up the sun. How can you not love that little squishy face? We've just noticed that as she's grown, she's gotten two brown patches over each eye, rather than the one you can see here. 5. What is your favourite time of the day? Number six seems to have gone for a walk, because Bek didn't have it! 9. What is your favourite nonalcoholic drink? Well, water predominantly but I also like green tea, black chai teas and the occasional coconut water! That's easy - writing! To write for my "job" is incredible, and I love every second of it! I can't think of doing anything else! Jamie has become a great friend of mine and one who I am so glad to have found through blogging! She is the master baker - and should there ever be a Masterchef Baking series, she needs to be in it! Shellie is another blogger who has become a friend! She may make me extremely envious with her thermomix, but she is an incredible cook and baker and just generally a lovely girl! Paola is a beautiful girl with a beautiful personality who manages to eat incredible looking food all of the time. Not only does Lindsay make delicious food and have me wishing I had even a pinch of her or her husband's athletic abilities - the strength of her faith and devotion to God is so inspiring! Jenn reminds me so much of myself it's ridiculous. She comes up with the best recipes, is the lovely host of What I Ate Wednesday (WIAW) and isn't afraid to laugh at herself! Madison's blog is gorgeous. The photos are amazing and her recipes are super delicious! Heather is not afraid to try odd-sounding combinations and for that reason, she's a girl after my own heart! If you're ever looking for a restaurant to go to in Sydney - head to Rita's blog first! She takes beautiful pictures and her reviews cover all of the little details you want to know - and she's honest too! If you're in Australia and can't eat gluten, you'll want to keep an eye on Janelle's blog. She has the latest gluten free news and products as well as great tips on gluten free entertaining and more! I love Amanda's raw honesty. She tells it exactly like it is (or how she sees it) and isn't afraid to post the more controversial things in life. I'm extremely glad to see her return to the blog world once more! So tell me, what are your favourite blogs? I always love finding new interesting blogs, so please name some of your must-reads! Oh thanks so much for nominating us at Veggieful! So sweet :) You really made me smile! oh i love this. And i love that you get up and go walk ASAP! Fresh air and time soaking up Gods creation. Thanks for nominating me. Lots of new blogs here for me to read as well. YEA! You are so welcome, lovely! That's certainly the best part of walking - I'm so lucky to live right by a beautiful park and it's so peaceful in the morning! Me too! This summer I've decided that we're buying a brand new slip n slide and enjoying the sun - especially now that Jesse will be here for Christmas! Awww...thank you! So flattered that you enjoy reading my blog, even though I've been very erratic with posting this year. Love that you've tried on your mum's wedding dress! I tried my mum's one on when I was around 16 or 18 but then promptly grew too big for it - I'm both taller and a size larger than what she was then. Lots of fun but wouldn't have been my style anyway - it was pink! You are so welcome! I have been the same with posting, so don't worry! Wow, a pink wedding dress? That's different!